LEN - www.lankaenews.com | NAITA chairman ‘Dr’. 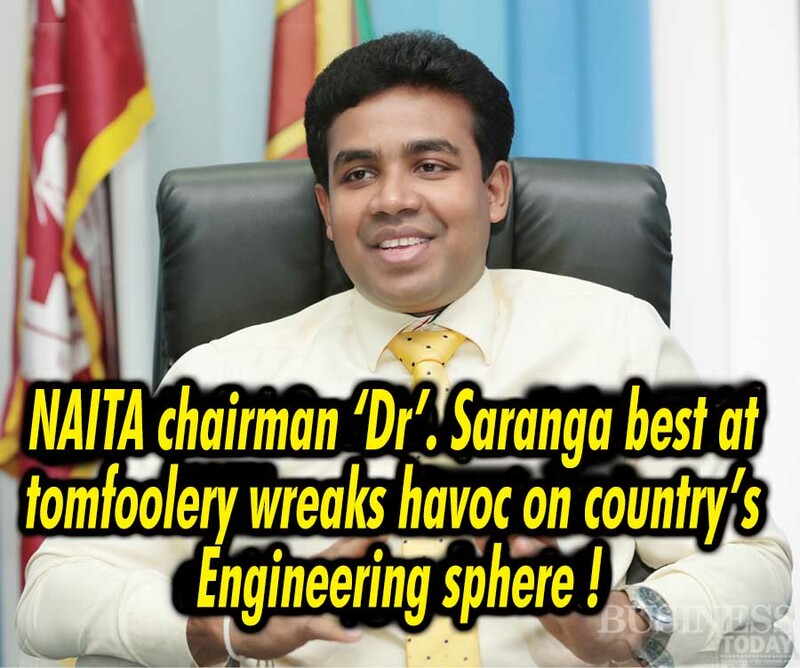 Saranga best at tomfoolery wreaks havoc on country’s Engineering sphere ! (Lanka e News -04.Sep.2018, 7.30AM) The Katunayake engineering Institute was inaugurated in 1985 based on a far sighted aim and agenda of present Prime Minister Ranil Wickremesinghe . This Institute has produced over 9000 engineers during the last 33 years. The engineering science diploma awarded by that Institute at the end of the course has a very special recognition locally and internationally. This is a course which is distinct from the four engineering diploma courses now in existence in the country. It is to be specially noted this Institute was the only higher education academy which conducted classes without closing down a single day sans any strikes when even schools were closed during the 1988/89 period of insurrection. Though it was administered by the NAITA (National Apprentice and Industrial training authority) , but because of the unique nature of the course , thousands of qualified chartered and statutory engineers have emerged from this Institute ..
To the consternation of all, this Institute chief now is one Saranga Alahaperuma whose hindquarters unfortunately is in his headquarters ,though he calls himself a doctor .That is, the chairman of NAITA an engineering Institute is under a doctor who knows absolutely nothing about engineering courses let alone any academic Institute. This stupid buffoon without any knowledge or background regarding engineering and academic courses is apparently only hell bent on creating the background to destroy the glorious Institute itself and its awards , it is learnt. It is most unfortunate that we are saddled as usual with the responsibility to expose this sorry state of affairs at the Institute following Saranga’s advent which is plunging a most reputed Institute into utter chaos and confusion . Saranga who has no idea , and has done no survey or appraisal pertaining to the employment opportunities available to grade 2 engineers in SL or abroad is suddenly trying to increase the present number of 250 students following the course to 800 within a month without any plan or program thereby compromising the career and future of thousands of students. It is the consensus he is treating his new appointment as a sport and play without any serious official goals in view for the country’s benefit. Since the Director /principal of the Engineering technology Institute ,Saputantri had not helped Saranga in his controversial and destructive activities, and pointed out the difficulties that are being faced (owing to his buffoonery ) , Saranga had suddenly transferred Saputantri to the NAITA main office. In addition Saranga following his Hitler policies has advised the legal officer of the Institute to somehow mount bogus charges against Saputantri with a view to pack him home. Saranga’s mental disequilibrium was further confirmed beyond doubt when he said openly at a discussion, there cannot be two lions in one establishment. Though he roared like a lion when making this announcement , he made a serious mistake by assuming that he is a lion when he is only a buffoon who knows only unalloyed buffoonery and tomfoolery . This statement also confirms that he is suffering from a serious superiority complex and therefore not fit to hold that lofty position. This is an Institution which was hitherto smoothly functioning . The students association which had never joined in discussions to stage protests or fasts in the history of the Institution have now been insulted and ridiculed by Saranga. Even the extraordinarily special national diploma award had been treated with contempt by Saranga. In addition , he has called the students by their names individually and after making reference to their villages had threatened them most viciously. Saranga who has by now proved what a buffoon he is , has found queer solutions to the issues of the students. One example is , in case there isn’t a desk and bench to sit , he had made two students to share those when following classes. The other example is if there are no space facilities , to conduct the classes during the nights and weekends. From this it can be inferred how much Saranga knows about higher education. If higher education can be expanded this way , the student intake to Universities can be made two fold overnight- all what is needed is a buffoon like Saranga at the top . Poor Saranga of course has no idea as to what havoc he is wreaking on the Institution . However lecturers and NAITA officers have been questioned many a time as to how he is going to increase the student intake three fold? Although all these sane and sensible officers and lecturers have understood this is an impossible task, they are however dumbfounded before the dictatorial attitude of Saranga and his fits of mental delirium . They know if they pinpoint his egregious blunders their jobs are at stake. Though Saranga in his delirious state may not know , everyone else knows they are dealing with a buffoon whose hindquarters are in the headquarters. Even to carry on the present educational activities the Institution hasn’t enough lecturers and laboratory facilities . There are not adequate toilets and latrines for the students . It is in this background Saranga despite being a responsible officer is conducting himself this abominably . Obviously it is clear , there is an invisible hand behind all his outrageous and obnoxious behavior deliberately aimed at sabotaging the affairs of the Institute. It is only the teachers , students and officers who know what great difficulties and distress they are facing in this backdrop to cover the module when providing the Industrial training with an eccentric like Saranga at the top. Doesn’t this so called doctor know, as in his profession so in every other profession , training has to be done methodically and duly? May be because mentally backward Saranga during his training period did sweet bugger all he knows nothing about training or its worth. It is being wondered whether because Saranga did not know how to treat even an influenza that he gave up his career. It is impossible to believe that Saranga has any knowledge of the actual state of the Industries in the country nor about the engineering training needs of the students. If he has any knowledge , will he introduce a program where an Institution is to provide training to 800 students ,in a country where it is difficult to find an Institution to accommodate 400 students ? When a state officer based on his professional incompetence and his immaturity introduces changes to a state Institution , a committee should be appointed to do a feasibility study and obtain its recommendation. Nothing like that has been done so far. If he is to do that now it must be with a sincere motive, for going by his conduct so far, it is likely only a committee of his henchmen will be appointed. It is a curse to appoint such shortsighted , reckless , rudderless ,mentally imbalanced heads to tertiary education Institutes .Owing to their bungling and wrong decisions taken , it is the future of a large number of innocent students that is going to be jeopardized. This buffoon of a chairman via all his bungling wittingly or unwittingly is striving to make this Institution also another SAITM. Saranga’s ill conceived plans perhaps owing to his mentally retarded state are only going to demean the entire profession , and erode the dignity attaching to these diploma holders. Shockingly, he is trying to generate 800 professionals suddenly without any constructive motive ,any sound logical basis or a feasibility study. Owing to his secretive program holding discussions at several places without making those known , it is doubtless the future of thousands of students are being imperiled. In a country where professionals are produced who can become statutory engineers under the Engineering science national diploma Council Act , because of the shortsightedness of this buffoon of a chairman whose favorite pastime is tomfoolery and who is an ignoramus as regards this Institute which is producing engineers who are professionals ,productive and compatible with the economic base of the country , the entire ‘edifice’ of learning is crumbling . It is unfortunate the true evil outcome of his actions is going to have a most detrimental impact not only on the entire country but even the future , meaning that the present and the future generations will have to face the dire consequences. Being a two legged buffoon ,no matter what efforts are made from so many quarters to educate and enlighten Saranga on the gravity of this issue, he refuses to heed advice with the stubbornness of a donkey . Saranga who does not know anything at all about the expenditure involved when he is seeking to double the number of intake of students to follow this precious and prestigious national diploma course which meets all the required standards , may also be unaware of the data and details. Even if he knows ,it is very evident his bankrupt politics and his abysmal ignorance are prompting him to selfishly achieve only his ruthless personal agendas even at the expense of the future young generation .Doubtless , even a school going child will understand what he should do as a chairman after scrutinizing the data. Suspicions have arisen whether it is the underlying obnoxious motive of Saranga given his controversial conduct, to incite these students of science who hitherto never at trade union level staged protests against the good governance government, in order to make the government unpopular , and to instigate the students too to rise against the government. The so called Dr. Saranga not only now even during the Rajapakse era held government posts , only to finally prove his political bankruptcy and his egregious professional incompetence .It is no secret this bloke who is empty from top to bottom is a political pimp. His attitude and behavior are only creating unrest and tension among the students while the threats and intimidation too posed to students by him are continuing unrelentingly. Amidst all the muddling up and bungling of all his official duties , there is one task he is executing well – the task he has undertaken to embarrass and vilify the government. If those who are responsible in this connection do not delve into this and probe what this buffoon is up to , and the forces propping and prodding him from behind to do the damage he is doing now , it is he and his villains who will triumph.